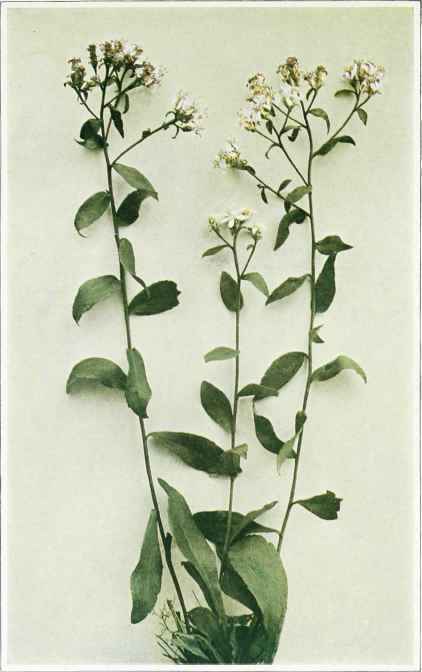 Stems rather stiff, erect or ascending, pubescent or nearly smooth, slightly angled, 1 to 2 feet high, from a perennial root. Leaves alternate, thin, smoothish or somewhat pubescent, ciliate, faintly three-nerved and pinnately veined, the basal and lower leaves obovate or spatulate, toothed or rarely entire, 2 to 4 inches long, 1 to 11/2 inches wide, narrowed below into margined petioles; upper leaves smaller, oblong or oblong-lanceolate, toothed or entire. Meads of flowers about one-half of an inch high, densely clustered in a terminal, cymose panicle; involucres bell-shaped, their bracts coriaceous, oblong, ciliate or pubescent, the outer ones shorter and with green reflexed tips. Ray flowers white, conspicuous, four to six in each head. Disk flowers perfect, their corollas tubular, narrow, yellowish and five-lobed; achenes slightly compressed, linear-oblong, one-nerved on each side, pubescent; pappus of numerous hairlike, rough, brownish or whitish bristles. In dry or sandy woods, Maine to Ohio, south to Florida, Alabama and Kentucky. Flowering from July to September.